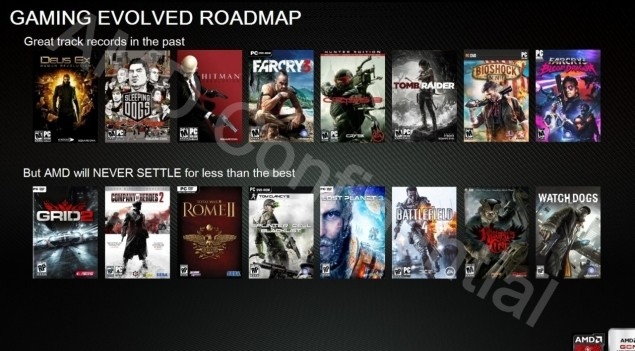 Rumor: New Never Settle Bundle Roadmap leaked: Battlefield 4, GRID 2, Watch Dogs and more! An image started floating at internet forums today showing some new titles that are supposedly gonna be added to AMD Never Settle Bundle program. The new titles include AAA games like Battlefield 4, Lost Planet 3, Company of Heroes 2, Splinter Cell Blacklist, Total War Rome II, GRID 2 and Raven’s Cry. Very impressive if turns out to be true! Take this with a pinch of salt as it has to be confirmed yet.